Beluga whale spy-hopping. Photo courtesy of Robyn Angliss, NOAA, National Marine Mammal Laboratory. Beluga whales are toothed cetaceans that are easily identified by a white, stocky body and a protruding forehead called a melon. These whales, which are actually born a blue-gray color, can grow to about 4.5 m (15 ft) and weigh over 3,000 lbs. The males are slightly larger than the females. 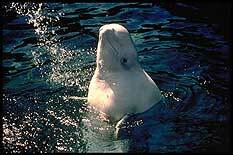 Belugas are primarily found in the very cold waters of the arctic and subarctic regions of the northern hemisphere, generally near pack ice or in open water. Although some populations are migratory seeking warmer waters in the summer, many are year-round residents of the Arctic. In addition, there is a sub-Arctic group that is a year-round resident of the St. Lawrence River Estuary. Lacking a dorsal fin, these whales are able to maneuver easily under floating ice (See How do marine animals use sound to navigate?). Beluga whales are the only cetaceans that do not have fused neck bones and as a result, they are able to move their heads from side to side and up-and-down. Group of belugas in St. Lawrence, Canada. Courtesy of Peter Scheifele, Department of Animal Science at University of Connecticut. Belugas are widely known for their diverse and frequent vocalizations and have been given the nickname, “sea canaries.” These sounds are used for echolocation and for communication with other individuals. (See How do marine mammals communicate using sound?) Originating in the air sacs of the head, these vocalizations sound like a variety of whistles, squeals, chirps and clicks. It is even possible to hear these sounds above water or through the hull of a boat. 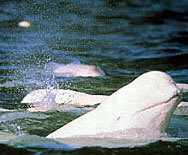 Belugas emit non-echolocation calls with an average frequency range from 2.0 to 5.9 kHz. Additionally, a captive beluga produced echolocation sounds between 40 and 60 kHz in one location and between 100 and 120 kHz after it was transported to another location.